Wheeler School – Angell Building — Ed Wojcik Architect Ltd. The Angell Building Common Spaces renovation at Wheeler (grades nursery through 5th) included conceptual planning, design development and Construction documents. The renovations include lighting and interior finish upgrades. 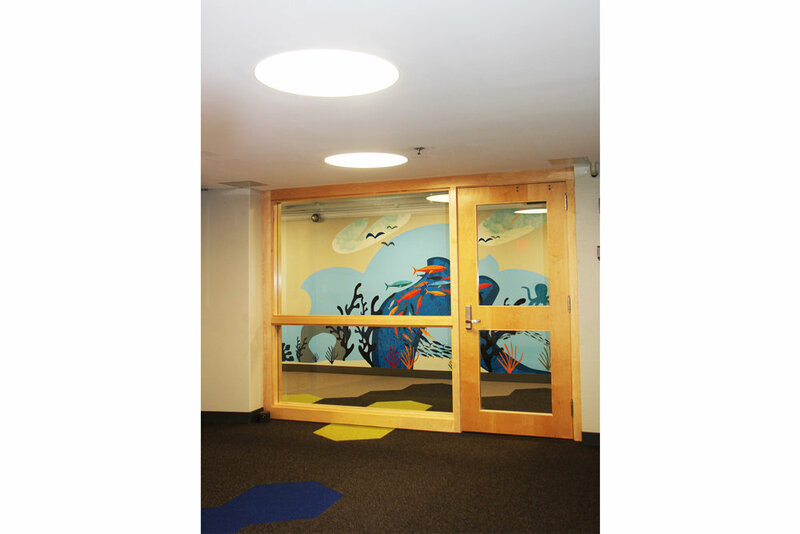 EWA has collaborated with 4 Eyes Design to develop age-appropriate murals throughout the corridors to create artful “moments”. In addition to the murals, the strong use of color and hexagon-shaped carpet create a unique and inspiring space not only for wayfinding but to stimulate and foster creativity for the students. Other renovations to the building include Interior finish updates to Classrooms and Restrooms and new casework throughout the building.